The public is advised that a Severe Swell Forecast has been issued for Monday, 20 February 2017. It is estimated that large north-westerly swells of three to four metres will commence at about 2pm on Monday, possibly lasting for up to five days. During this time, the public is asked to take care when visiting the Sea Front. To avoid damage to vehicles, drivers are also advised not to park vehicles in this area. Sea conditions will be monitored by Port Control and access to the Sea Front and Wharf areas may be restricted for safety purposes. 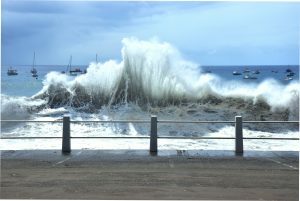 To prevent damage, or loss of property, boat owners are also advised to inspect the security of their moorings prior to the expected large swells on Monday. The public will be kept informed if there are any changes in the forecast or if conditions improve.